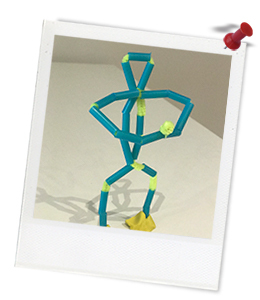 Quick summary: In this lesson, students connect health and wellbeing knowledge and experiences with Visual Arts by creating models of yoga poses using pipe cleaners and straws. The lesson explores healthy lifestyles and practises, exploring yoga’s benefits for both physical and mental health as well as engaging students in physical activity. It also includes revision and application of knowledge of the elements and principles of art and design as well as an understanding of colour theory. this lesson has been created in partnership with education specialists, OfficeMax. Students are aware of strategies they can apply to be happy and healthy. Students explain artistic choices in relation to the visual conventions of elements, principles, composition and style. Syllabus outcomes: MOS2.4, GSS2.8, PHS2.12, SLS2.13, GSS2.8, GYS2.10, ALS2.6, VAS2.1, VAS2.2, VAS2.3, VAS2.4. Cross-curriculum priority: Asia and Australia’s Engagement with Asia. Relevant parts of Year 3 and 4 Health and Physical Education Achievement Standards: Students interpret health messages and discuss the influences on healthy and safe choices. They understand the benefits of being healthy and physically active. They use decision-making and problem-solving skills to select and demonstrate strategies that help them stay safe, healthy and active. They refine fundamental movement skills and apply movement concepts and strategies in a variety of physical activities and to solve movement challenges. They create and perform movement sequences using fundamental movement skills and the elements of movement. Relevant parts of Year 3 and 4 Visual Arts Achievement Standards: Students describe and discuss similarities and differences between artworks they make and those to which they respond. They discuss how they and others organise the elements and processes in artworks. Unit of work: Learning Through Art & Craft – Primary. Level of teacher scaffolding: Low – students will view explicit step-by-step instructions and be provided handouts to scaffold completion of the task. Resources required: Device capable of displaying presentation and video. Space for students to complete yoga movements. Harmonious Colours Handout (one per student or equipment to project to the class). Artist’s Statement Template (one copy per student). Student Worksheet (one copy per student). Pipe cleaners (minimum three per student, various colours). Straws (minimum five per student, various colours). Air drying clay (white). Boxboard and coloured paper (one per student). Wire Model Step-by-Step Instructions (equpment to project to the whole class). Keywords: Yoga, health, fitness, mental health, exercise, elements of art, craft, design principles, colour theory. Students are aware of strategies they can use to be happy and healthy. ... explain physical benefits of yoga. ... explain benefits of yoga to mental health. ... perform simple yoga poses. ... link choices they have made in their work to elements of art and design principles. ... explain the use of complementary and/or analogous colours in their work. A practise now quite familiar in Australia, yoga continues to be shown to have a wealth of health benefits for both physical and mental wellbeing. Yoga Journal writer Timothy McCall even goes as far as to list 38 health benefits of yoga, ranging from improvements to posture and flexibility to increased focus and happiness. Thought Starter: Did you know that Yoga is an ancient Indian philosophy that dates back thousands of years? The purpose of this task is to create a model of a yoga pose using the techniques shown in the clips that your teacher shared. These models will be displayed in various locations around the school with a description of the artwork and an explanation of the value of yoga. Which yoga pose you will create a model of. 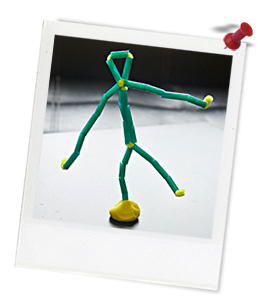 How the pipe cleaners will be connected to create the figure. What part of your model will connect to the clay base. What types of colours you will use (complementary or analogous).